Yesterday was a banner day for the United States--and not in a good way. The President began the day by obliterating the First Amendment in his personal and unreasonable attacks on CNN and ended the day by insulting native Americans and using a racial slur while denigrating a member of Congress. It is almost scary to consider what "off-the-cuff" utterance will be next. It is OK to have a favorite network, but any effort to interfere with the freedom of the press is specifically against the First Amendment to the Constitution. 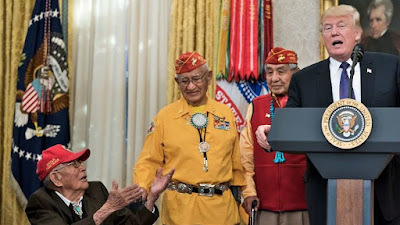 And then later in the day, according to NPR, at a ceremony honoring surviving Navajo WW2 code talkers, the President destroyed the solemnity of the ceremony by making insults and using what is considered a racial slur against a U.S. Senator. What possessed him to tangentially add such comments into the ceremony? Where does it stop? When will ethics and decorum be restored to the highest office in the land? When again will we have a leader that we can be proud of and rally behind rather than shudder every time he opens his mouth or makes another tweet? In this case, I might substitute the word money for power.